After some frosts and cooler weather the leaves have turned and my yard has more color. The hostas are especially bright, and surprisingly the foliage of the lily of the valley are also a bright yellow. Upper left is a picture of a self seeded maple from the container of another plant. I had bought it in fall and the color was pretty, my dog had died and so it is planted over the bones of Old Fritz. A good dog who liked to help “herd” the chickens back into the chicken coop. It is probably a Red Maple. Next down is the foliage of the Kousa dogwood, a burnished, soft red. Last in the row is my driveway planting. ‘Diablo’ physocarpus far left, sedum variegatum turned a pale yellow above that is moss phlox which becomes golden tinged, the euphorbia ‘Bonfire’,dianthus gray leaves, and the blue of the Blue Star Juniper. Sweet Gum showing more color now, although the same sort of tree in the foreground is still mostly green. Next down is a small Kousa framed by an arbor and maple tree. Third down is the goldflame spirea- which turns a pretty range of pinkish coral through a hue of red. 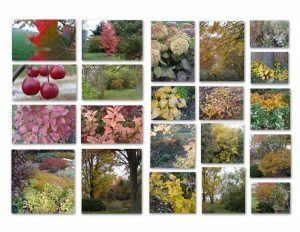 Bottom is a view of various maples with globe arborvitae hedge in the foreground. Annabelle hydrangea which has rustic tints. A frost blasted hosta is next down. Third down in the row is a view through the yellow leaves of the mock orange, with a spot of the golden hosta foliage. Bottom of that row is the good color of the ‘Hansa’ Rugosa rose. Top of the next row: melange of maples. The yellow colors of Amelanchier canadensis, a shrubby little plant that holds its foliage longer than its cousin, A. laevis, which has lost its leaves already. It never really grew very large. Larger view of the mock orange sandwished between the V. burkwoodii, which has no real fall color, and the dull lilac. At bottom are the silver maples sporting yellow. Leftover asters, but most are blasted by the frosts. Second down, the ‘Royal Standard’ hostas around the tree. Third down is the golden yellow of the lily of the valley foliage and the feverfew which blooms for a very long time here. Next down is the Hydrangea ‘Tardiva’ in goldenrod tints. …And last, another view of it against the background of the Sweet Gum. My Prarie Fire crab is as orangea pumpkin right now. Love this tree all year long!